Oh man, indeed. The eggless house-made ice cream is sprinkled with crunchy sea salt and cascaded with a confetti of starchy red beans, sweet corn kernels, chewy coconut flakes and cubes of silky flan. Together, it’s a rich, salty-sweet delight that’s impossible to describe within the limits of the English language. 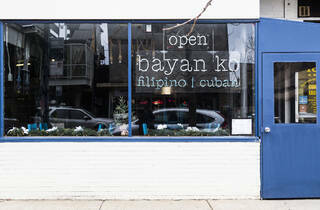 The idea behind a Cuban-Filipino restaurant might seem similarly complex for the uninitiated. 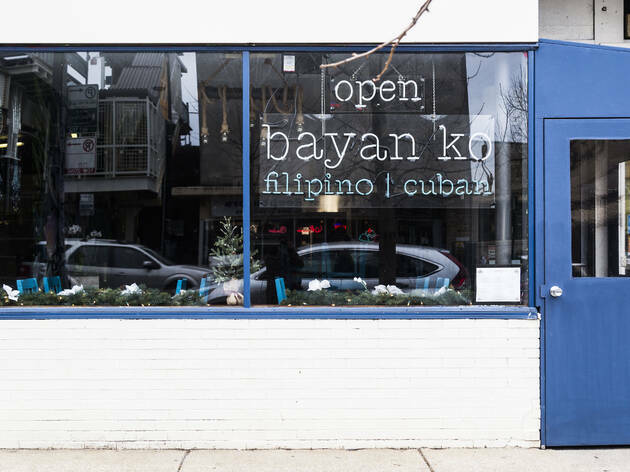 Bayan Ko—which translates to “my country”—is a culinary representation of the real-life partnership between husband-and-wife team Lawrence Letrero and Raquel Quadreny, who trace their roots to the Philippines and Cuba, respectively. 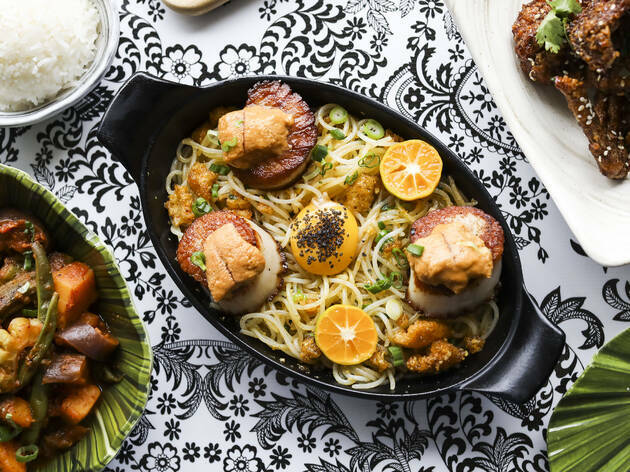 Quadreny manages the front of house, while chef Letrero retools classics from the disparate, postcolonial island nations. 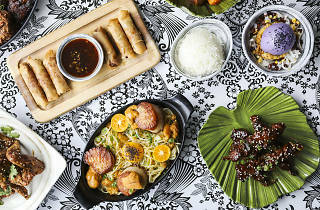 The flavors play together beautifully and occasionally collide on a single plate, as is the case with the Bayan lechon, with hunks of crisp fried pork belly, garlicky mojo and a tangle of sweet Filipino papaya slaw. 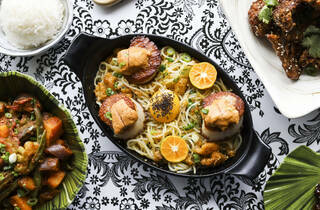 Bayan Ko represents soulful second-generation cooking at its finest, and I can’t wait to return. A generous helping of BBQ pinchos arrived first, with juicy little bricks of grilled pork shoulder marinated in a tangy-sweet melange of cola, banana ketchup, soy, sambal and garlic. Cigar-shaped lumpia egg rolls shattered between our teeth to reveal the moist, aromatic ground pork and matchstick-thin veggies within. 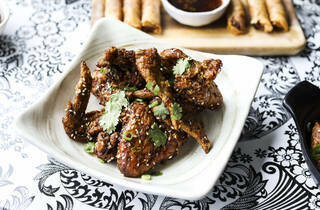 We dabbed them in thin garlic-soy dipping sauce that’s a punchy ode to Letrero’s mother’s recipe. Laced with blistered cabbage and shiitake mushrooms, an order of pancit noodles was a likeable if onenote dish, tasting mostly of earthy funghi and soy, though we delighted in the glutinous chew of the fresh miki noodles. 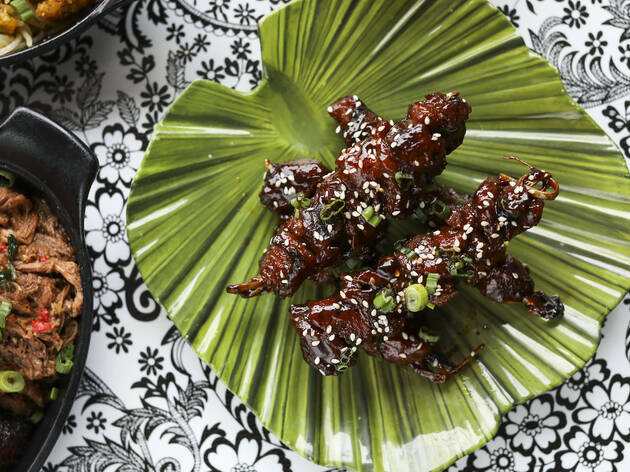 Guests are better off leaning into the meat-packed menu, a notion that was reinforced with the arrival of the crispy adobo chicken wings. 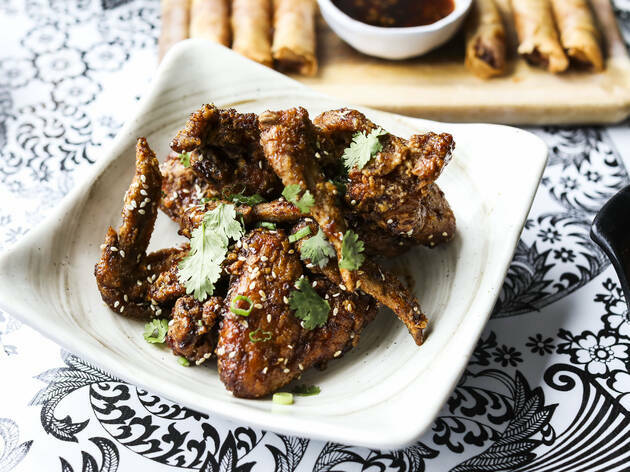 The exemplary poultry is treated to a spicy dry rub and half-day marinade before it’s dusted in rice flour, twice-fried and coated in a vinegar-soy glaze. 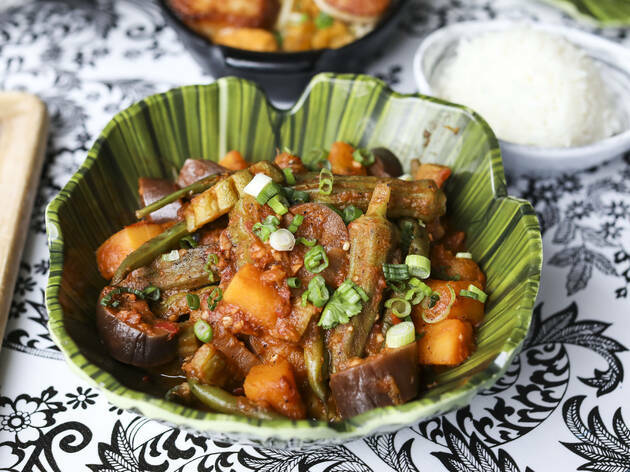 Though less prominent than its Pinoy counterpart, Bayan Ko’s Cuban voice rang out decisively in garlicky prawns bathed in orange mojo. 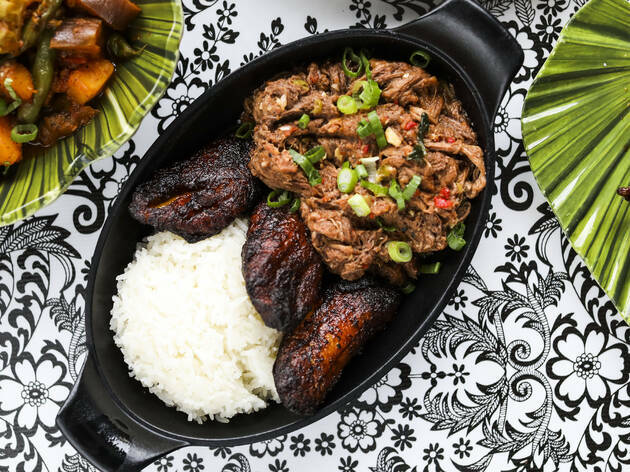 Ropa vieja, served with toothsome black beans and lacquered maduro plantains, largely adhered to tradition, too, save for Letrero’s decision to use fatty brisket in place of typical flank steak, which yielded succulent shreds of meat that osmosed their spicy braising liquid. 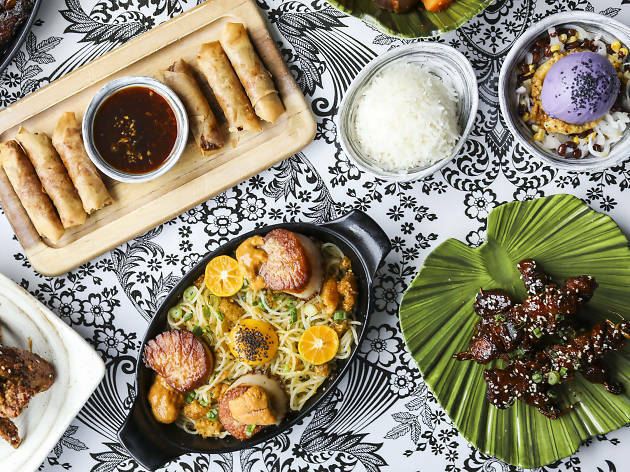 Despite the seemingly endless parade of delicious, soul-soothing fare that Quadreny deposited at our table—“wow, you guys are really going for it!”—I couldn’t help but covetously mourn each dish we hadn’t ordered. Oh no, there go the mussels again! God, why didn’t we order the luglug noodles? “You can get the noodles next time—you’re allowed to come back,” our server reassured me. I’m just not sure I can wait a whole month. 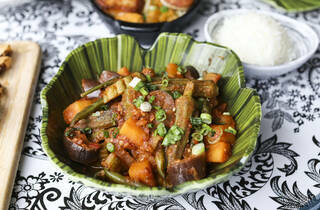 Who’s up for dinner at 4pm tomorrow? 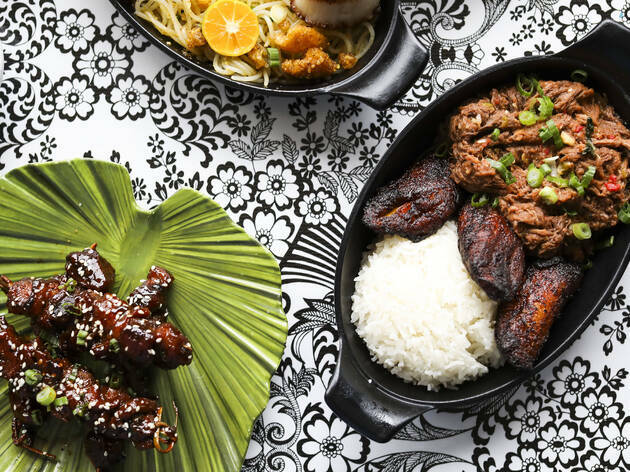 Atmosphere: Hiding beneath the Montrose Brown Line stop, this tiny storefront dispenses a highlight reel of satisfying Filipino and Cuban shareable plates drawing from the owners’ immigrant roots. 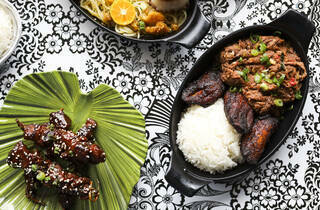 What to eat: Iconic Pinoy and Cuban dishes pepper the menu, occasionally colliding in garlicky, sweet, acidic bliss. 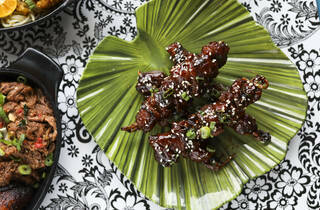 Don’t miss the luscious BBQ pork pinchos, crackly twice-fried adobo chicken wings, Bayan lechon or the ube ice cream. What to drink: The restaurant will keep its BYOB policy for the foreseeable future and charges a $5 corkage fee. 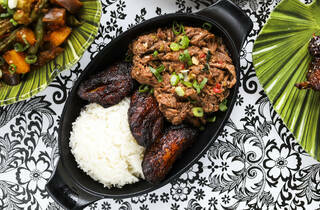 A hearty Portuguese red, French rosé or thirst-quenching lager would all go down beautifully with the flavorful fare. Where to sit: Weekend tables book up a month in advance at this snug 32-seat storefront, so plan accordingly.